President of USIP, Nancy Lindborg, invited the Youth Leaders, a balanced group of young women and men, from Afghanistan, Burma, Colombia, Iraq, Nigeria, Sri Lanka, South Sudan, Sudan, Syria, Tunisia, United Arab Emirates and the USA to introduce themselves. She then invited His Holiness to open the conversation. “Usually I get eight or nine hours sound sleep at night, but lately when I wake up I’ve been wondering how many people were killed while I slept; how many children died of starvation? The current situation is very sad, but just feeling despondent is of no help. If we ask ourselves who creates many of the problems we face, the answer is that we human beings do. Therefore, it’s logical that if we make the effort, we can take steps to solve them and avert the suffering involved. “Scientists have found evidence that basic human nature is compassionate. It’s the common experience of all 7 billion human beings be cared for by their mother with love and affection. And it’s common sense that if we acknowledge our sameness as human beings, we more easily make friends. These are grounds for being optimistic. “What will really change the world is coming to better understand our emotions and how to manage them on the basis of secular ethics. I believe we can change our emotions by using our intelligence to raise our awareness. Since it’s evident that the use of force provokes further violence, we have to adopt a more human approach—and we can start by recognising each other simply as brothers and sisters. This is how we could make this a more peaceful century. With Nancy Lindborg’s guidance the Youth Leaders summarized the work they are each doing and put questions to His Holiness in relation to it. In his answers he encouraged the young people to be determined, just as those who engage in violence often are. He emphasized the special strength women can bring to promoting inner values, human values, in the world today. He added that responsibility for change rests with members of the younger generation like them. They must cultivate a vision of a better future and work hard to achieve it. Time and again His Holiness stressed the role of a more holistic education. Following some discussion of the difficulty of changing entrenched attitudes, for example in relation to the role of women in education and leadership, Professor Samdhong Rinpoche contributed some Gandhian advice. He said it was important to distinguish between an action and its agent. We can oppose an action or prejudice without adopting a negative attitude towards its perpetrator. 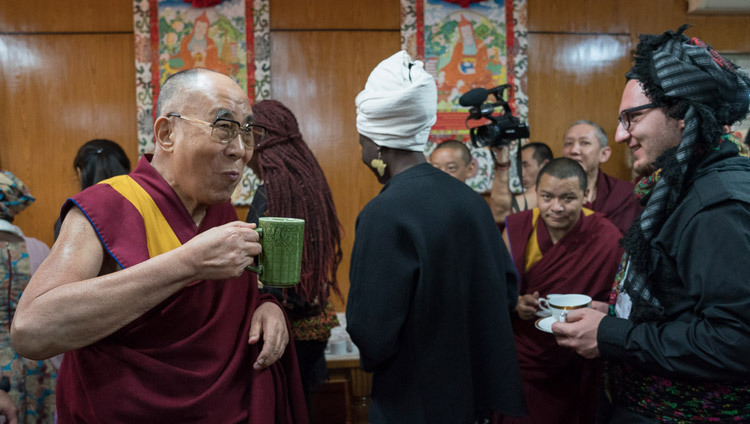 His Holiness added that a real test of the extent and strength of your compassion is whether you can apply it to those you consider opponents or enemies. He recommended a simple solution to disagreements—meet and talk. 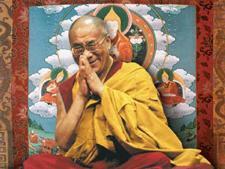 His Holiness suggested that sometimes being practical and realistic is the most sensible course of action. He mentioned that most Tibetans were nomads and in the cold climate of Tibet wore clothes made of sheepskin. When they came to India, they could not cling to their customary ways, they simply had to adapt and dress accordingly. With regard to the question of religious faith and identity and the trouble they can cause, His Holiness pointed out that in terms of personal conduct and practice it is fine to think of one truth and one faith. However, in relation to the community at large in the wider world, it is necessary to recognise a multitude of faiths and various aspects of the truth. At several points in the conversation His Holiness expressed his admiration for the Youth Leaders’ work and the spirit they bring to it. The dialogue will continue tomorrow morning.